Chemists in the UK have bound three long-chain organic molecules together with one macrocyclic ring ‘like strands of wheat in a wheatsheaf’ for the first time. David Leigh’s team at the University of Manchester specialises in making such rotaxane systems, where macrocycles usually surround a single central axle, for example to make molecular machines. ‘Mechanically tying together polymer strands in this way could have some interesting effects, just as binding things together with string has uses in the “big world”,’ Leigh tells Chemistry World. 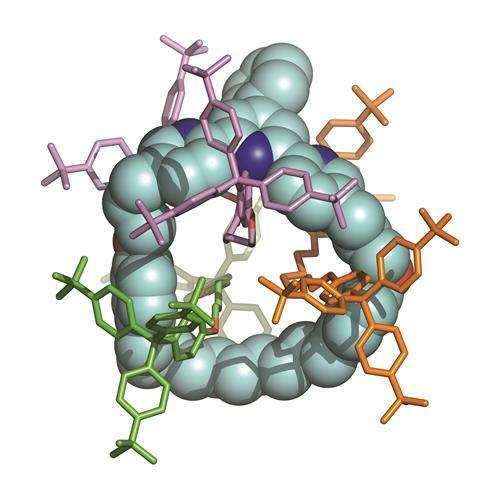 Rotaxanes are normally made using intermolecular interactions to slide an axle through the ring and then putting stoppers on either end to prevent it coming out. To fit multiple axles through macrocycles therefore means overcoming contradictory requirements. The hole at the macrocycle’s centre must be small enough not to slip over the first axle’s stoppers before another one is added. However, it must also be big enough to fit all the axles when assembly is complete. Leigh’s teams molecular modelling showed that even small increases in hole size meant much larger stoppers would be needed. They therefore used a slightly larger macrocycle than usual, mixing it with the half-axle molecules and a nickel salt in relatively simple reaction conditions. After 18 hours, they decomplexed the nickel, and analysed their mixture. They found no singly-threaded rotaxane, but lots of empty macrocycles, suggesting that the first axle had indeed frequently slipped out. However, enough had stayed in place long enough for a second and a third axle to join it, enabling Leigh’s team to detect plenty of double- and triple-threaded systems.